When the pace of life is taking over, there is a helpful solution: you can use breathing techniques to relieve stress and anxiety. Once learned, they can be used in a variety of situations e.g. before an exam or interview or prior to a performance to reduce anticipatory anxiety. Breathing techniques can control anxiety “during” an event or can be used naturally throughout the day. Breathing techniques can also help with insomnia when the mind is racing and needs to slow down before the sleep response can take over. Hypnotherapists commonly teach breathing techniques to relieve stress and anxiety in the early stages of a hypnotherapy treatment. It often forms the first stage of the hypnotherapy induction. Progressive relaxation and visualisation are also used to create a deep state of “inner focused awareness”. This helps the patient to become more receptive to hypnotherapy suggestions given by the hypnotherapist. During the early part of the first hypnotherapy consultation, I like to ask my patient about any prior learning of breathing techniques to help them relieve stress. By ensuring that you are using the full potential of each breath, it can facilitate a more rapid hypnotic induction. The benefits of learning breathing techniques can also help the client relieve stress outside of the hypnotherapy consultation. They can use practise these breathing techniques independently or use them with the assistance of a hypnotherapy relaxation CD. Even for those who have had some previous relaxation training outside of hypnotherapy, I am often surprised at how much emphasis is given to counting as the most important feature of breathing techniques to relieve stress. Leave out the numbers. Each person’s breathing rate is different. With the aim being to slow down breathing patterns, I prefer the inspiration of air to be drawn in through the nose. The nostrils have a smaller surface area compared to the opened mouth and so help to ensure that the duration of inspiration phase is lengthened. Breathing techniques: Hand placement to feel the abdomen move. Whilst there is some flexibility with where you breathe out, my preference is still through the nose rather than the mouth. Unless a client has some prior learning and is proficient with several of these stages, I won’t make too many changes for them. Again, the smaller surface area is the advantage and keeping the focus in one place is just easier to remember for the novice student. I demonstrate and instruct the client to place one hand on their abdomen and the other hand on their chest. I ask them to look down at their hands to provide visual and kinaesthetic (feeling) feedback at this stage. 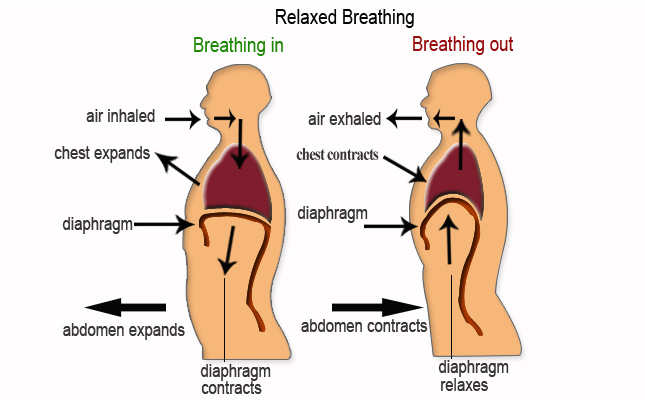 In relaxed breathing, the abdomen (lower hand) moves before the chest (upper hand). This ensures that the important diaphragm muscle (the sheet of muscle that lies horizontally between the thoracic cavity and the abdominal cavity) is active in the breathing process. This stage usually causes the novice (anxious breather) to push their abdomen out forcefully because it can feel unnatural to the untrained. What is paramount at this stage is that the air being inspired (by the movement of the diaphragm) is creating the abdominal inflation. A picture of the diaphragm and ribs moving during breathing can help visualise this process. I also ask my student to imagine feeling that the inspired air is expanding the abdomen. This image usually creates the desired effect. With the abdomen (diaphragm) now responsive, the second stage of the inflation involves a fuller breath by expanding the ribcage (chest). The untrained anxious breather instinctively finds this easier, hence the inclusion of stage 5 which is aiming to change a bad habit. I identify any unnecessary mechanisms at this stage now, like lifting the shoulders which play no valid part in breathing. With these mechanisms in place, I then progress onto tempo. Since each person’s vital capacity (the maximum amounts of air that can be inhaled or exhaled from the lungs) differs, emphasising a “one-fits-all” number system would create an unnatural count for those on the upper and lower limits. My approach is to individualise this stage by just prolonging each inspiration and expiration. This is a form of “hypoventilation” that makes each breath more efficient for relaxation. It may take a few breaths to settle this pattern and that would be acceptable. Particularly with the inspiration of breath, the odd forced inhalation can seem like an “awakening” for some of the new muscles being used in this way. For the expiration however, I liken this stage to gently squeezing a balloon with the tiniest air-opening that lightly resists the pressure just enough to keep the air being constantly expelled. Extend the exhale for as long as possible. Trust that your body has enough oxygen in each breath. With the diaphragm actively involved the body can cope sufficiently by simply slowing these processes down. Exhaling with a slow, deep audible “sigh” is important because it enhances the release of tension and relaxes the respiratory system. Only a few, slow deep sighs are necessary and the breathing mechanisms naturally adjusts. The awareness of breathing can go into the background and become more unconscious. With the breathing now in constant flow, I emphasise a pause rather than a breath-hold. Create this pause at the end of each inspiration and expiration. Anxiety can cause breathing muscles to tighten, so a natural pause encourages continuity between each stage rather than a segmented “stop”. Imagine these stages akin to a large, slow-moving swing that has a huge momentum as it swings effortlessly in and out, almost delaying at the end of its swing, yet it is gathering momentum ready for the next slow swing. If it hasn’t happened naturally by now, many clients are innocently entering lighter stages of hypnosis and closing their eyes by themselves. As the client or student begins to access these breathing dynamics, mentioning eye closure helps to bring in more of their imagination and the internal awareness of their relaxation responses. A suggestion to remove the hands from the abdomen and chest and lay the hands comfortably on their lap can be a suitable progression for the progressing learner. A general observation of the client’s posture is natural for the hypnotherapist. For the novice who is learning to relax, freeing areas of tension can be facilitated when the mind is engaged into your internal state. Gradually work through the body from top to toe (or from toe upwards), releasing of any tense areas. Visualise each body part feeling helplessly heavy. Choose a place to practise at home where the head and body can be supported e.g. a high-backed chair, recliner or lying on the bed. These are the latter stages of relaxation training in which the topic can be an article in itself! In my hypnotherapy consultation, I discuss how my patient likes to relax. I then integrate this imagery into the hypnotic induction. 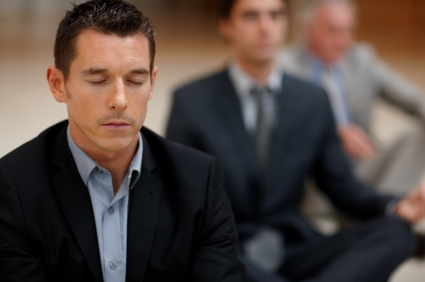 Being mindful of your breathing techniques is an important part of relieving stress and anxiety. Your autonomic nervous system controls all of the unconscious bodily functions like gut functioning, heart rate, breathing and the release of hormones like adrenaline. By controlling your breathing, it gives you an opportunity to take back some conscious control over what your mind and body is doing. In effect, your breathing can be your “doorway” into slowing down some of the “fight or flight” responses that are triggered by modern living stress. This article has outlined how to use breathing techniques to relieve stress. As a practising hypnotherapist, my teaching points are built on a collection of numerous consultations with past hypnotherapy patients. I do not advocate that this is the only way to teach breathing techniques to relieve stress. Being responsive to your hypnotherapy patient and observing where to focus help is part of being a successful hypnotherapist and creating therapeutic change.